Dominion Resources announced unaudited reported earnings determined in accordance with Generally Accepted Accounting Principles (reported earnings) for the three months ended Sept. 30, 2016, of $690 million ($1.10 per share) compared with earnings of $593 million ($1.00 per share) for the same period in 2015. Operating earnings for the three months ended Sept. 30, 2016, amounted to $716 million ($1.14 per share), compared to operating earnings of $611 million ($1.03 per share) for the same period in 2015. Operating earnings are defined as reported earnings adjusted for certain items. The principal difference between reported earnings and operating earnings for the quarter is related to transaction costs associated with the Dominion Questar combination and our investments in nuclear decommissioning trust funds. Dominion uses operating earnings as the primary performance measurement of its earnings guidance and results for public communications with analysts and investors. 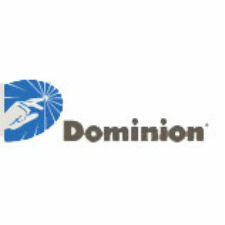 Dominion also uses operating earnings internally for budgeting, for reporting to the Board of Directors, for the company’s incentive compensation plans and for its targeted dividend payouts and other purposes. Dominion management believes operating earnings provide a more meaningful representation of the company’s fundamental earnings power. “We are very pleased with our strong third-quarter results that came in well above our guidance range partially as a result of warmer weather in our service territory. Our integrated system of power stations and transmission lines were able to meet the increased demand reliably and effectively. “We continue to execute on our growth projects including starting construction of the 1,588-megawatt Greensville Countycombined cycle power station. The project is on-time and on-budget. “Our large contracted solar farms, Four Brothers and Three Cedars in Utah, were completed last month, on time and on budget. We have a number of solar projects under development in Virginia and North Carolina and continue to see demand for renewables from our customers.